№29446705 71st annual Cannes Film Festival - 'Everybody Knows' - Premiere and Opening Ceremony Featuring: Georgina May Jagger Where: Cannes, France When: 08 May 2018 Credit: Euan Cherry/WENN. №29446505 71st annual Cannes Film Festival - 'Everybody Knows' - Premiere and Opening Ceremony Featuring: Alice Taglioni Where: Cannes, France When: 08 May 2018 Credit: Euan Cherry/WENN. 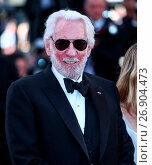 №29445205 Celebrities attend the premiere for 'Yomeddine' at the Palais de Festival in Cannes, France. Featuring: Atmosphere Where: Cannes, France When: 08 May 2018 Credit: Euan Cherry/WENN. №29416843 71st annual Cannes Film Festival - 'Girls of the Sun' - Premiere Featuring: Sara Sampaio Where: Cannes, France When: 12 May 2018 Credit: Euan Cherry/WENN. №29416743 71st annual Cannes Film Festival - 'Girls of the Sun' - Premiere Featuring: Kendall Jenner Where: Cannes, France When: 12 May 2018 Credit: Euan Cherry/WENN. №29415343 71st annual Cannes Film Festival - Fashion For Relief - Catwalk show & Afterparty Featuring: Winnie Harlow Where: Cannes, France When: 13 May 2018 Credit: Euan Cherry/WENN. №29415143 71st annual Cannes Film Festival - Fashion For Relief - Catwalk show & Afterparty Featuring: Winnie Harlow Where: Cannes, France When: 13 May 2018 Credit: Euan Cherry/WENN. №29381381 71st Cannes Film Festival - 'Rendezvous With John Travolta - Gotti' - Photocall Featuring: Valeria Golino Where: Cannes, France When: 14 May 2018 Credit: Euan Cherry/WENN. №29379081 71st annual Cannes Film Festival - AmfAR Gala Featuring: Izabel Goulart Where: Cannes, France When: 17 May 2018 Credit: Euan Cherry/WENN. №29378181 71st annual Cannes Film Festival - Knife + Heart - Photocall Featuring: Vanessa Paradis Where: Cannes, France When: 18 May 2018 Credit: Euan Cherry/WENN. №29376881 71st annual Cannes Film Festival - 'The Man Who Killed Don Quixote' - Photocall Featuring: Terry Gilliam Where: Cannes, France When: 19 May 2018 Credit: Euan Cherry/WENN. №29376781 71st annual Cannes Film Festival - 'The Man Who Killed Don Quixote' - Photocall Featuring: Adam Driver Where: Cannes, France When: 19 May 2018 Credit: Euan Cherry/WENN. №29376481 71st annual Cannes Film Festival - Closing Ceremony Featuring: Benicio Del Toro, Kimberly Stewart Where: Cannes, France When: 19 May 2018 Credit: Euan Cherry/WENN. №29391908 71st annual Cannes Film Festival - BlacKkKlansman - Premiere Featuring: Jane Fonda Where: Cannes, France When: 14 May 2018 Credit: Euan Cherry/WENN. №29391008 71st annual Cannes Film Festival Featuring: Alessandra Ambrosio Where: Cannes, France When: 14 May 2018 Credit: Euan Cherry/WENN.